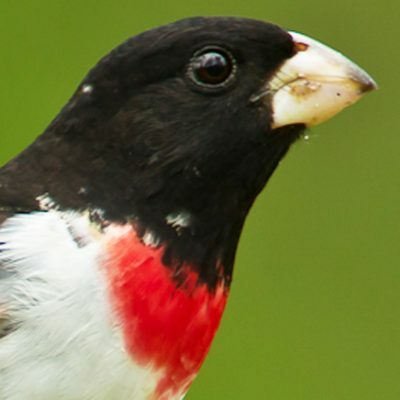 If you see this gorgeous black and white bird with a scarlet chest at your feeder, it’s a Rose-breasted grosbeak. You may first know he is around by his equally beautiful song. These birds arrive in late Spring from Central and South America, and some continue migrating through the US into northern Canada to nest. These birds are named for their thick (“gros” in French) beaks which can handle seeds, insects and fruit. They are often found in wooded areas and if you are lucky enough to have one of these birds at your feeder, keep it stocked with sunflower seeds and raw peanuts if you want them to stick around. Their lovely song is similar to a Robin’s lilting sound, but considered to be even more sweet and beautiful.